The clips include both explicit Alexa commands and background conversations. 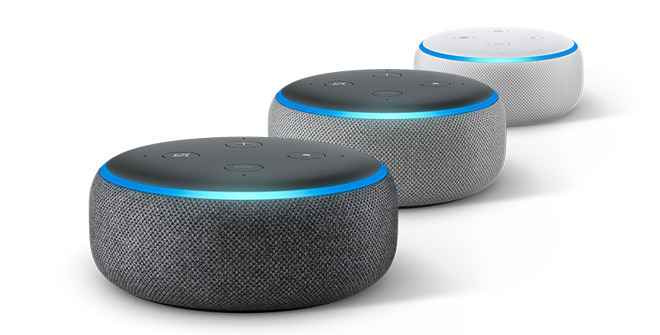 Echo devices are constantly scanning audio for a trigger phrase -- "Alexa," "Echo" or "computer" -- which when deciphered activates the assistant and initiates a connection to Amazon's servers. Audio recordings begin shortly thereafter. Amazon reportedly constructed policies to deal with distressing audio clips, but two employees who sought help when they stumbled upon such snippets were told it was not Amazon's responsibility to take action. Employees have taken to sharing unsettling -- or amusing -- clips on an internal chat system. Next up, Facebook watches you through the Portal in your bedroom. The only real risk to me is embarrassment, but it's not likely someone I know personally is ever going to hear me saying or doing something I'd wish they hadn't. It's true that I don't want an Amazon contractor hearing my passwords or financial codes, but in the absence of a way for them to determine exactly who I am, even that information is essentially useless to them. The lack of transparency and anonymity is troubling. The article mentioned “banking information” but I wonder how many people are actually using explicit information about their account to the point it could be compromised. My guess is zero to not very many. I mean, when was the last time you came home and said, “Hey, honey! I just wanted to let you know that I deposited that $10,000 into our Bank of America checking account # 520439203949!”? I'll stick with HomePod thank you very much! Worth every penny! If “hate” speech becomes illegal it’s just a matter of time until someone at Amazon, or the AI, takes a joke out of context and the police are knocking on your door. In reality though no one cares what you think about it. People that don’t care about privacy will buy one, and those that do won’t. Pretty simple. But your bank is only recording conversations you when you call them, not every time you use your phone. And, sure they’re more detailed, but isn’t that detail that directly pertains to your business with the bank? It’s not like you’re calling them and discussing the results of your most recent doctor visit. I also doubt that the bank is taking those recordings, having another person (possibly a third-party) parsing it and transcribing every word you say and asking others for help when they can’t understand a word here or there. I'm glad that I don't have any Google or Amazon surveillance devices listening into any of my conversations. I am also glad that I do not use Android for my mobile OS, as I do conduct banking transactions from my devices and I do use them to make payments. I protect my privacy and I care about my finances. Can you imagine some rabid liberal working at Google or Amazon or Facebook or some other place listening into my private conversations? Haha. Not a chance in hell that I would ever trust them or any extremists working there, as they have been busted so many times in the past for their unethical behavior. They would probably embark on a private vendetta against me, because my private conversations would most definitely trigger some snowflake asshat that was working there. I do not trust them, I do not trust their intentions and I do not believe what they claim. I don’t use any banking apps on my iPhone or iPad. However, I was recently reading the T&C of the UPS mobile app. UPS kinda went out of their way to say that when using the UPS app on an Apple device UPS, not Apple, is solely responsible for the app and any information or content received through it. Immediately following that part was where the T&C mentions that if using the app on an Android device that any information submitted by the user may be shared with Google because Google provides functionality that the app relies on. Huh? Doesn’t Apple also provide functionality that the app relies on (on iOS)? How come when it’s Android then Google needs to be party to the information in the UPS app but when it’s iOS Apple can stay out of it? I’m curious if there is any similar wording in banking apps. I'm proud to say that I don't know too much about the specifics of Android, as I have never touched an Android device in my entire life, but could it have something to do with how permissions are handled on iOS vs on Android? When people sign a deal with the devil, then they shouldn't be surprised that bad things might happen. Nothing to see (or hear) here. If Apple isn't doing this, well at least that would explain why Siri doesn't seem to improve as fast as other virtual digital assistants. Speaking of banking information, if they can see your personal data then your account could be compromised. Take the Experian breach which took my SSN, addresses, and all my banking info for CCs, student loans, automobiles, mortgages, and who knows what else. For each bank they have even more specific data on purchases as well as bank accounts that are connected, and when I'm likely away from home based on spending habits which include locations This isn't something Alexa would record after hearing the wake word, but it's something countless people in many countries around the world probably have access to. I'm certainly more concerned with that than an Amazon employee listening to a random audio clip where I'm asking about movies, the weather, to adjust lights, or music. It's a little embarrassing that they know I listened to Carly Rae Jepsen's Call Me Maybe on repeat for months, but I'll just continue to pay the ransom every month to Bezos so no one else finds out. In reality though no one cares what you think about it. Well, excuse the hell out of me. I thought sharing opinions and observations was the whole point of having a forum in the first place. And how do you know Apple isn’t recording and maybe selling all your data? Oh, wait... you don’t. Here I can help you with this, give me the passwords and UID's to all your email accounts and I'll let you know if you have anything to worry about. What I worry about is web people think this maybe okay, then companies think this is pay for then to infringe on everyone's privacy. Three more people think this is okay, the worse it makes it for everyone else. I understand exercising some prudent caution when it comes to privacy, but before we go all tinfoil chapeau let's put this in context. If you call XYZ Widgets to order a bucket of nails, you give a human being your name, address, telephone number, and credit card info. Why would you be more concerned about a having that call recorded by a glorified answering machine then having it translated by someone who doesn't know anything more about you than your first name? How is it any more invasive than any other method of doing business? It doesn't matter to me whether you choose to do business via a smart speaker or not, but I don't understand your reaction to my considering doing so (I don't even have such a device at the moment). What's described in the article seems LESS risky than many actions we willingly undertake every day. Okay. So what? Once you give permission, that's what happens. If you refuse, you don't get your banking done. I don't understand your point. Seems like an entirely acceptable and unsurprising thing for Amazon to do. People are comfortable telling things to Alexa, and they have an expectation that it will understand them; how did they think Alexa knows this stuff? I neither have, nor want an Echo, but this isn't the big deal some people want it to be.